This exhibition opens the conference “From A Sudan to Another: Social and Political Restructurings Underway”, 10-12 June 2013, Addis Ababa, Ethiopia. Sudan’s Blue Nile state is situated at the borders with South Sudan and Ethiopia. Composed of a variety of minority tribes, many straddling the border with Ethiopia’s Benishangul-Gumuz state, Blue Nile has often been described as “a microcosm of Sudan”. Two months after South Sudan’s separation, the war resumed in the state in September 2011. Since then, at least 15% of Blue Nile’s population has walked to refugee camps in South Sudan and Ethiopia. 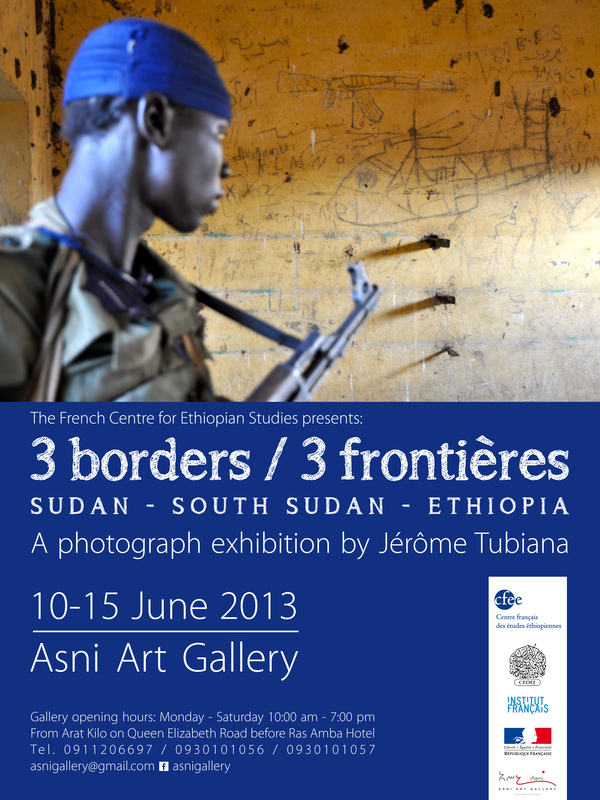 Researcher and photographer, Jérôme Tubiana travelled into the narrow strip of land controlled by the rebels at the tri-border between Sudan, South Sudan and Ethiopia. The separation of the two Sudans in July 2011 opened new fields for research in Social Sciences. Most of them are yet to study. The CEDEJ-Khartoum and the CFEE-Addis Ababa launched a scientific dialogue process on Sudans in June 2012. The conference aims 1. at giving a scholarly content to the debate on Sudans, which official talks often miss to address; 2. to offer a platform for debates between Sudanese and South Sudanese scholars and intellectuals who cannot discuss since the beginning of the process of independence of South Sudan. This intellectual dialogue is more necessary than ever today. Addis Ababa provides a neutral ground where academics can gather and exchange outside of official peace talks that are held there under the auspices of the Ethiopia government and the African Union. 1. The concept of frontiers questions both the border between the two countries and the divisions within each of them. This point emphasizes the difficulties faced by Sudan and South Sudan regarding the delineating of a border. The outline of the border lacks legitimacy and is bristled with uncertainty. Along with the question of the delineation of the borders comes that of its management, both in terms of resources sharing and individuals’ movements. 2. The concept of mediation provides new perspectives on the management of the conflict on a regional scale, and enables to analyze the influence of third countries or organizations. 3. The concept of compromise enables researchers to tackle central issues such as coexistence, collective memory or national identity, on a bilateral scale. 4. The concept of marginalization/diversity management within each country challenges conflict prevention and resolution on an internal scale.